Porter Consulting Engineers has once again been selected to join LandCorp’s Civil Engineering Panel for civil, traffic, electrical and ancillary structural consulting services. To implement its proposed capital works program, LandCorp recognises the importance of establishing and maintaining close working relationships with a select group of consultants over a term arrangement. 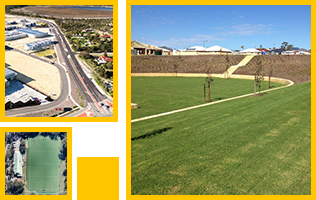 Porter Consulting Engineers is engaged as Superintendent of construction on many of the LandCorp projects that proceed to construction. The scope of works often include the design, costing and construction administration of projects such as clearing of sites, construction of new facilities and/or the relocation and upgrading of existing facilities. One of the main aims is for Porters to be involved with land development projects that are not only economically and environmentally viable, but also socially sensitive.